Bugatti Veyron is undoubtedly a definition of superfast production cars, that not only deliver performance but keeps the impeccable legacy unstained. With its recent release under Les Legendes de Bugatti, company unveiled the sizzling Bugatti Veyron Black Bess 2014 at Le Mans. Let us have a look at the review of Bugatti Veyron Black Bess 2014 to know more about this hot selling limited stock model. Interior of Bugatti Veyron Black Bess 2014 comes drenched in high-grade leather featuring dual tone through light beige and Havana. However the steering wheel inside will remind the vintage lovers of Type 18, as it comes wrapped in Crimson Red leather with contrasting red stitching. The essence of red stitching further engulfs the outer bolsters of the seats and seat belts. The main part which takes all the accolades in the interior of Bugatti Veyron Black Bess 2014 is the door panels. You can find Roland Garros airplane sketch and to be mentioned that it is hand painted for every model with a special ink and impregnation process. 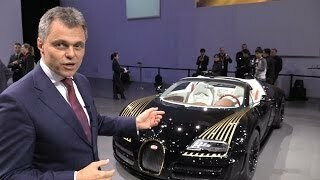 This fact makes the Bugatti Veyron Black Bess more exclusive. You can also notice hand-paint work over the cover of storage apartment located back. Apart from these best-quality rose-wood work can also be noticed over selector lever and console panel. The exterior of Bugatti Veyron Black Bess 2014 is special in only one way and undoubtedly it takes all the credit. We are here talking about the body color which is inspired by a 100 year old model. You can also notice intense use of carbon-fiber in making of body and it all comes painted in black. He major aspect taking all the gleam is the 24-carat gold plating work over the horseshoe grille and rear badge. Apart from these the same essence reaches in form of stripes to headlamps and reaching till upperside of doors. The black and gold trim further continues and marks its impeccable presence over the black wheels that come adorned with gold hub. 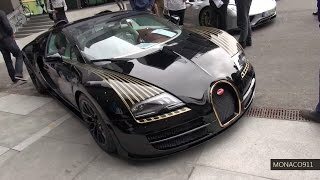 You won’t be surprised to know that the Bugatti Veyron Black Bess 2014 hides beneath its hood a 8.0 liter W16 engine generating total output of 1200 hp and peak torque of 1500 nm. 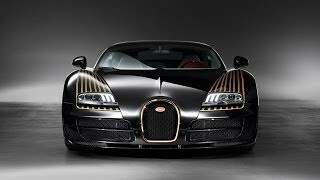 The power thus rolls the wheels and enables it to sprint from 0-62 mph in just 2.6 seconds while top speed of Bugatti Veyron Black Bess 2014 comes to 254 mph.